I would say if government is untrustworthy, this drop from seventy percent to twenty percent is a huge improvement. The problem comes if we take the polling statistic as an indicator of trustworthiness. On that view, the more people answer yes, the more worthy of trust our government is. When nearly three quarters of all citizens expect government to do the right thing, they must be responding to genuine honesty and openness, as well as competence and a spirit of public service. Or they could be naive, not to say gullible. No government in all of history has ever proven itself worthy of trust. Government means power, and if you ever forget what power does to people who have it you are in big trouble. If few people trust government, that’s good, because it means people have a realistic view of their situation. They are ready to be good citizens. People who expect government to treat them nicely are not ready to be good citizens. Governments love people who look to power holders for kind treatment. Rulers require only a bit of cleverness to corrupt that relationship. According to the mainstream argument, government actually accomplishes good things. People with faith in government’s beneficence point to Social Security, the interstate highway system, desegregation, public schools, the Internet, flood control, public health, protection of the small guy against large corporations, and so on to support their view. They continue with the argument that when people run the government down, ridicule it, and try to sap its strength, public authorities can no longer accomplish good things. Government can no longer contribute to the public welfare when most people believe it’s composed of criminals and corrupt accomplices. The mainstream view holds that extreme distrust of government amounts to an unhealthy destruction of the public square, a pernicious set of attitudes that we should correct before our republic goes to hell. Even today I have a twinge of sympathy for this faith in civil service, as I grew up in a family during the 1960s that subscribed to this view. We were among the seventy percent. Today, however, I believe in government’s capacity for mischief as firmly as I believe in God’s capacity for good. As with many people in my generation, Vietnam and Watergate broke my young faith that government could or would accomplish good things. The process of breaking faith ended over forty years later, when our national security state instituted a worldwide regime of torture to accomplish its ends. Our republic ended at that point. On God’s altar and as citizens, we had to swear hostility to this kind of tyranny, which existed in our own house. Did government change, and become less trustworthy? Did it take a sharp turn toward eventual tyranny when Jack Kennedy died in November 1963? Or did the roots of tyranny extend far back from that turning point? On the latter view, diminished trust in government coincides with tyranny’s greater visibility. The more brazen government has become in its exercise of power, the more citizens recognize the danger they’re in, as well as sources of the danger. In this environment, you cannot say that distrust of government costs us too much. You cannot say that government’s ability to work for public good suffers too much when citizens reject its power. Government authority has shown us clearly what it wants to do with its power. 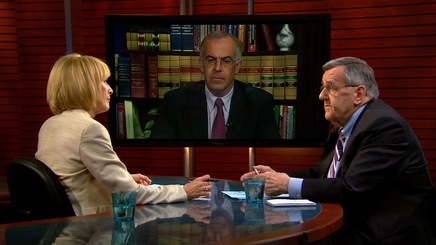 David Brooks and Mark Shields are people of good will and good heart. They too belong to our broken, endangered republic. They appear to harbor hope that we can and ought to restore trust in government – return to a state where citizens, through their government, can accomplish good things for themselves. Sagacious Thomas Jefferson would say, don’t fool yourself. People can accomplish good things, in groups and as individuals, but not through government, at least not through any government that has grown as ours has. We all say government is a necessary evil, then forget how evil it has been. When we distrust government, we recognize its true nature. Even self-government, de Tocqueville’s near utopia in so many respects, evolved toward the dangerous situation we find ourselves in now. Renewed faith in government at this point does not signify restoration of the public square. It signifies capitulation – to a soft tyranny that becomes harder and more self-confident by the year. Renewed faith in a weak, truly limited government might serve us well, but we have travelled a long way from limited government. In a real and terrifying sense, our government is the CIA and the Pentagon, with Congress reduced to a debating society. …I have learned enough about the machinations of the CIA in the past years to know that this is no longer the dream world America I once believed in. The imperatives of the population explosion, which almost inevitably will lessen our belief in the sanctity of individual human life, combined with the awesome power of the CIA and the defense establishment, seem destined to seal the fate of the America I knew as a child and bring us into a new Orwellian world where the citizen exists for the state and where raw power justifies any and every immoral act. I’ve always had a kind of knee-jerk trust in my government’s basic integrity, whatever blunders it may make. But I’ve come to realize in Washington, deceiving and manipulating the public is viewed by some as the natural prerogatives of office. Huey Long once said, ‘Fascism will come to America in the name of anti-fascism.’ I am afraid, based on my own experience that fascism will come to America in the name of national security.